In 1944 the Westland design bureau, headed by W.E.W. Petter, started to investigate a design intended as a successor for the Blackburn Firebrand naval strike fighter and torpedo bomber. What Petter had in mind was a single seat aircraft with roughly the same performances in speed and climb as the latest generation of piston engine fighters of that period. 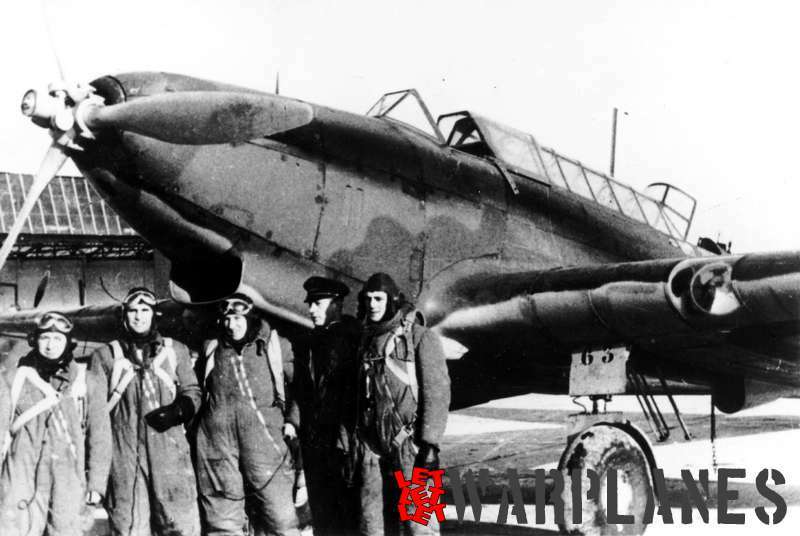 The ideas finally resulted in the Westland W.34. Originally it was planned with an engine placed in the fuselage centre, driving a tractor propeller with a large extension shaft running under the cockpit section in the same way as had been done at the U.S. Bell P-39 Airacobra fighter. The final design from September 1944 used the most powerful reciprocal engine of that time fitted in the nose and driving a 4-blade contra-rotating double propeller. That engine was the new 46 litre capacity Rolls Royce Eagle liquid-cooled 24 cylinder producing an ultimate 3500 hp. The new Eagle was fitted with four rows of six cylinders in a H-shape. In fact, the Eagle was the reply of Rolls Royce on the similar sleeve valve Napier Sabre engine, but it was bigger and much more powerful! The Air Ministry drew up Specification N.11/44 for Westland’s design. Based on Air Ministry data for new turboprop engines then being considered Westland had to make their design suitable for replacing the Eagle at a later stage by a turboprop engine of an estimated output of more than 4000 shaft-hp. 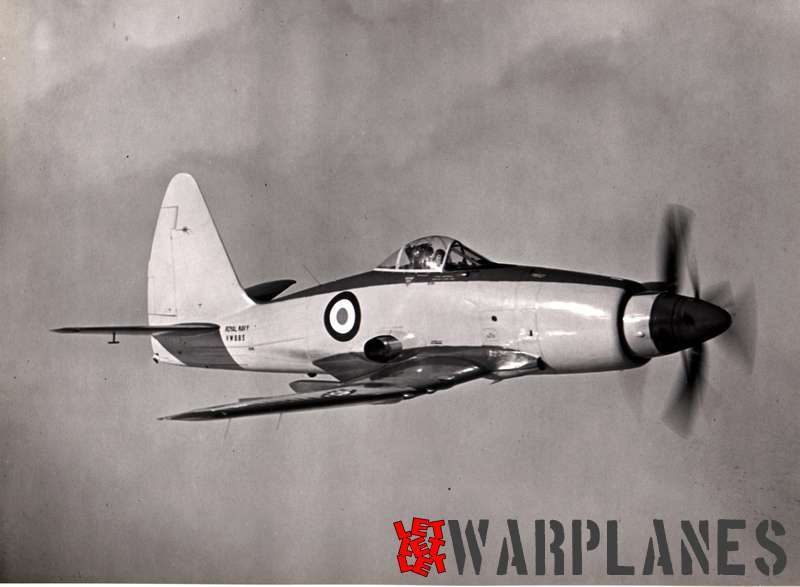 Westland named the new attack plane the Wyvern. 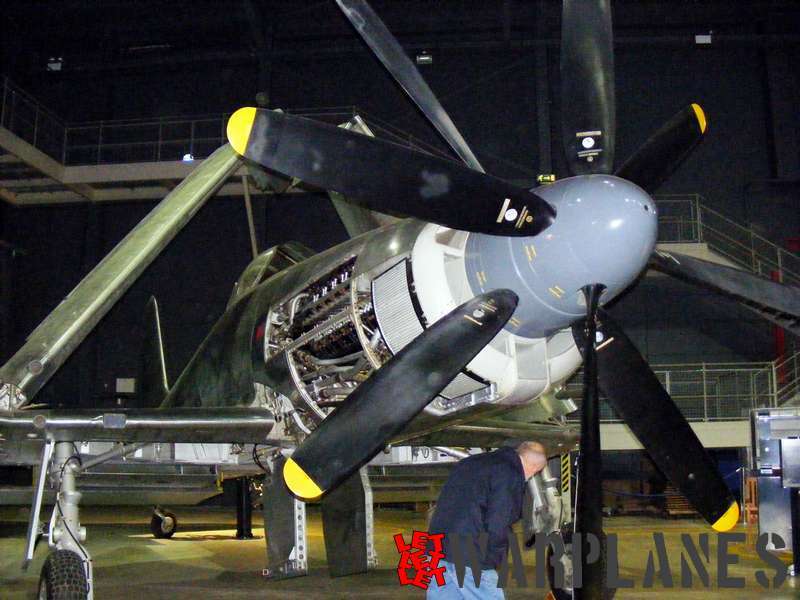 The same VR137 showing its Rolls Royce Eagle engine inside the FAA museum at Yeovilton. Petter’s design showed a fighter-like aircraft with a slightly humped upper fuselage section for a good forward view during deck landings. Wings were broad and elliptically shaped with upwards folding outer wings. The cockpit had a single-piece backwards sliding canopy for an optimal all-round vision. On occasions, VR137 was shown outside the museum hall. It was photographed on 30 July 1988 at Yeovilton. Selected armament were four wing-mounted 20 mm Hispano cannons and hard points under the wings for various external offensive stores like rockets and bombs. Under the fuselage section there was room for an aerial launched torpedo. For use from aircraft carriers the new strike fighter was fitted with an arrester hook in the tail and large telescopic hydraulic struts for the main undercarriage to absorb the energy of a deck landing. To slow down landing speed during deck landings the new attack plane was fitted with large Youngman flaps. 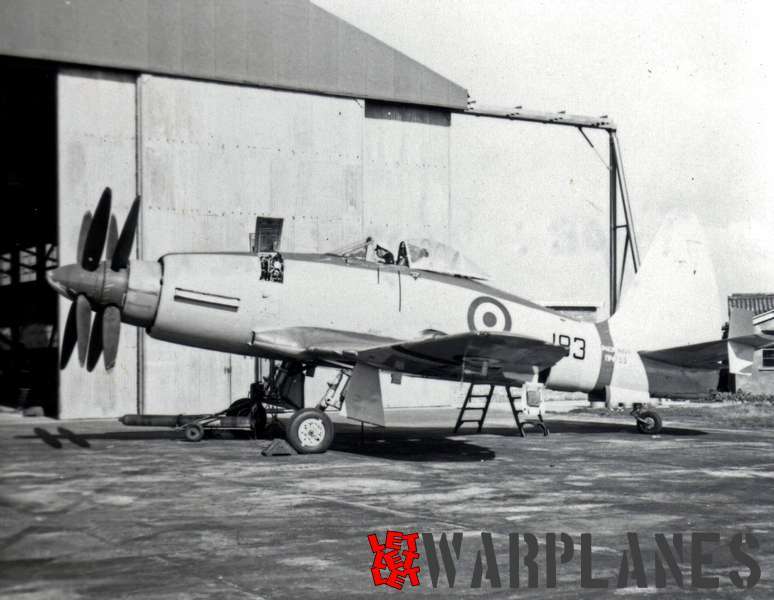 Although the Air ministry abandoned further development of the Rolls Royce Eagle engine, Westland was requested in February 1946 to build a first batch of six prototypes fitted with this engine since a suitable turboprop was not yet available at that time. Serial numbers assigned were TS371, 375, 378, 380, 384 and 387. The first two were unarmed, but TS378, 380, 384 and 387 already had their four cannons fitted in the wings for operational evaluation. TS371 and TS375 also lacked the wing folding mechanism and arrester hooks as fitted on the later four prototypes. Under an amended Specification N.12/45 Westland was also requested to build three further prototypes, one with the Rolls Royce Clyde and two with the Armstrong Siddeley Python turboprop engines. Serial numbers for these three aircraft were VP120 for the Clyde powered Wyvern and VP109 and VP113 for the Python powered version. The Eagle powered Wyverns were indicated as TF Mk.1, while the Clyde and Python powered machines were designated as TF Mk.2. In spite of the Eagle being not further developed, Westland received an order to manufacture ten TF.1 Wyverns for operational testing and evaluation. They were assigned the following serial numbers: VR131, 132, 133, 134,135, 136, 137, 138, 139 and 140. In fact, VR137 was never flown and VR138, 139 and 140 were never completed! The first prototype Wyvern TS387 was flown for the first time on 12 December 1946 by Westland Chief test pilot Harald Penrose. This was also the first flight of the Rolls Royce Eagle engine. Also the double four-bladed Rotol constant speed contra-rotating propellers were used for the first time on an aircraft! It was lost on 15 October 1947 when the propeller bearings failed in flight. Westland’s assistant test pilot Sqn. Ldr. Peter Garner was killed when he tried to make an emergency landing. As could be expected the combination of a new airframe, new engine and new propellers resulted in a number of teething problems and delays in the production. 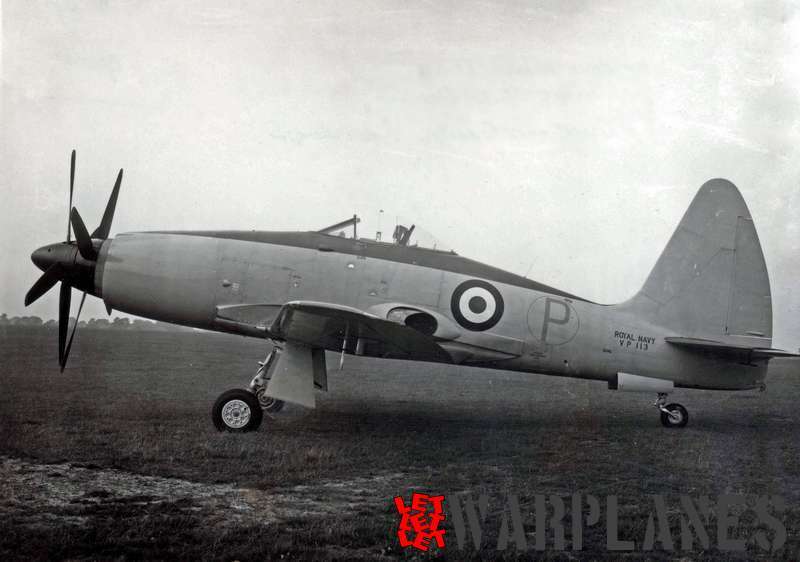 It took a while before the planned Rolls Royce Clyde and Armstrong Siddeley Python turboprop engines were available for flight testing and the single 4030 hp Clyde powered Wyvern VP120 did not fly until 18 January 1949. With the much lighter turboprop engine the nose section had to be completely redesigned. It was also necessary to make alterations in the centre fuselage section for the large engine jet pipe exhaust. Since it was already obvious the Clyde would not go into production, this was in fact a dead end. The first flight of VP120 lasted only three minutes when shortly after take off, the cockpit was filled with smoke from a fuel leak onto the exhaust ducting. Flying the Clyde powered prototype was terminated after only 50 hours of flight time. 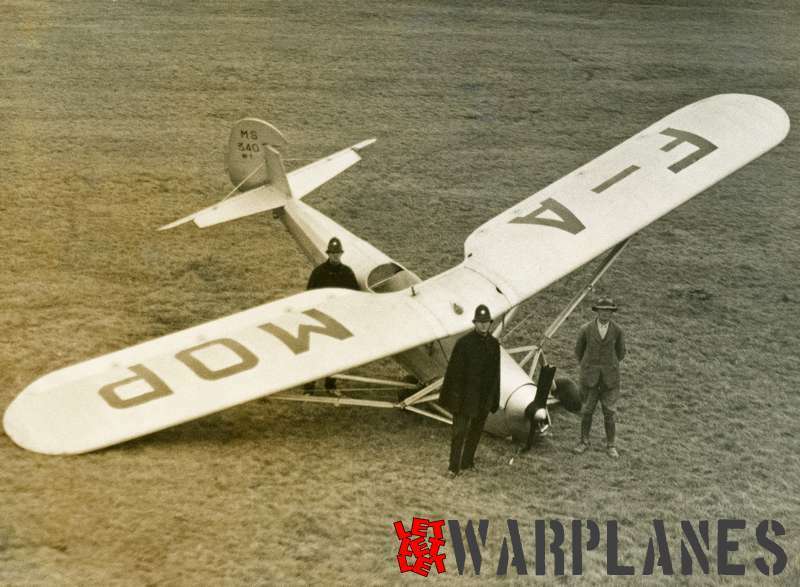 The aircraft was delivered to Napier & Son to be fitted with the experimental 3000 hp Nomad diesel piston/turboprop compound engine. However, development of this very complex engine was soon terminated and it was never fitted. VP120 finally ended its life as a test vehicle for crash barrier trials. The first flight of the Python powered prototype VP109 took place on 22 March 1949. Main visual difference with the Eagle powered TF.1 except for its engine was an enlarged rudder area to improve directional stability. On the final S.4 version additional vertical fins were placed on the horizontal tail planes. The S.4 also had a cut-back engine cowling to facilitate the loading of starter cartridges into a B.T.H. starter motor. The second prototype VP113 joined the testing programme with its first flight on 30 August 1949. Also the Python powered Wyvern had a troublesome start during operational testing with quite a lot of accidents. 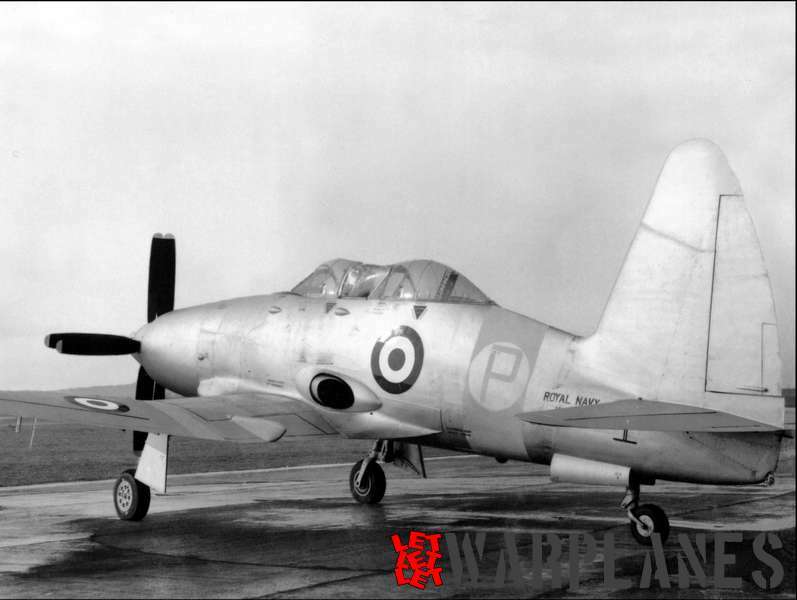 The single T.3 dual-seat training version of the Wyvern. Only one was built! Westland Chief test pilot Harald Penrose wrote off two Wyverns; S.Mk.4 VW880 and TF.Mk.2 VW867 after crash landings in January and February 1952. The TF.Mk.2 VP109 Python prototype was lost in April 1952 at Farnborough when Sq.Ldr. Leo de Vigne crashed it into a hangar after a deadstick landing. Lucky for him he only suffered minor injuries. 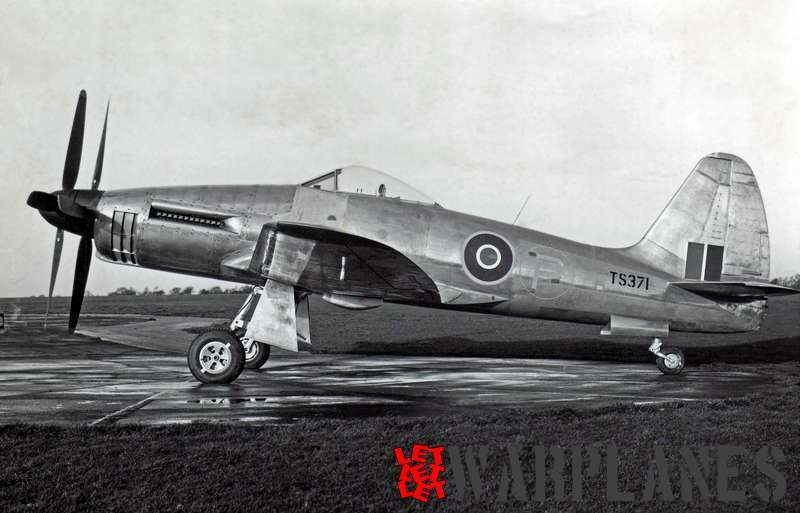 The second Python prototype VP113 crashed on 31 October 1949, killing Westland’s new test pilot sq. ldr. Mike Graves. In August 1952 TF.Mk.2 VW876 was lost after an engine failure during simulated flight deck starts and landings, also at Farnborough, when the engine quitted shortly after a catapult launch. It was wrecked during a crash landing in a nearby field. Further victims of various incidents were VZ746, VZ751 VW868, VW871, VZ747 and VZ775. In the crash of VZ751 on 21 December 1953 Lt.Cdr. Alan Koplewski from the U.S. Navy lost his life. Chief Armstrong Whithworth pilot Edward Griffiths was killed in VZ747. In total 11 more Wyverns were lost over its testing and operational period and the fitted ejection seat fully proved its usefulness! VZ783 was lost when the engine flamed out during catapult launch, again because of fuel starvation. The pilot, Lt. Macfarlane had on 13 October 1954 the doubtful honour of surviving an underwater ejection with his Martin-Baker ejection seat. 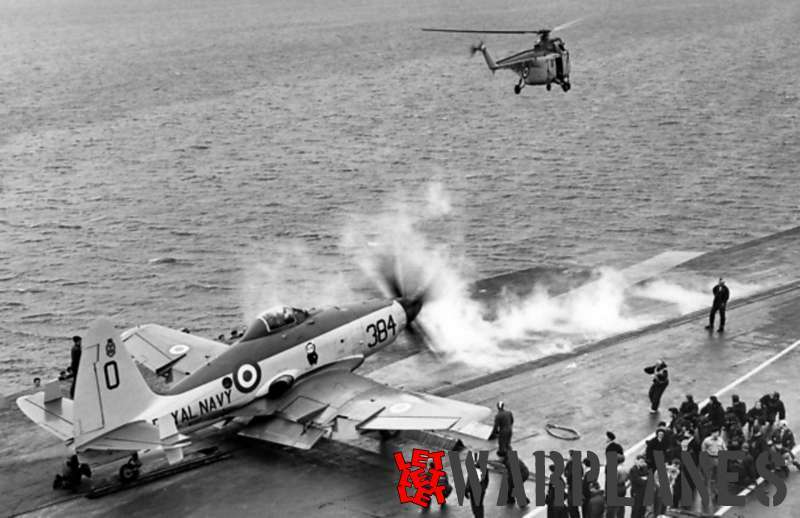 In spite of these accidents, the Wyvern pilots regarded their plane as easy to fly and, in particular, easy to land on an aircraft carrier. Total number constructed was 127 machines including the three engineless airframes VR138, 139 and 140. TF.1 and TF.2 stood for Tactical Fighter Mk.1 and 2, which was changed with the latest version S.4 into Strike fighter Mk.4. The trainer version was designated as T.3 for Trainer Mk.3. The TF.1 version received Westland’s type designation W.34. W.35 was used for the TF.2 and the final S.4 version. The type designation W.38 was used for the T. 3 two-seat conversion trainer. Only one prototype was built, the VZ739. It was used for a while by Westland as a company demonstrator. 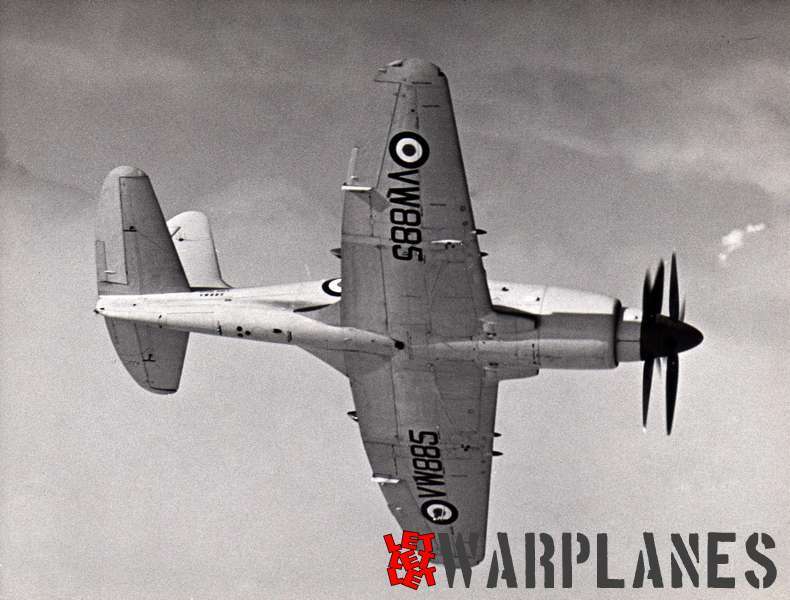 Although it had many teething problems during operational testing, like fuel starvation at catapult launch, the Wyvern went in May1953 into final operational service at the British Navy for use on aircraft carriers. In spite of its shortcomings as a propeller-driven plane, it was in general regarded as a useful piece of equipment for which it was designed: tactical strike operations with torpedo’s, bombs and unguided rockets. The Wyvern S.4 was in operational service with the Fleet Air Arm from 1954 to 1958. Wyverns equipped 813 Naval Air Squadron, 827 Sqn., 830 Sqn. and 831 Sqn. of the Fleet Air Arm. The Wyvern was based on aircraft carriers in the Mediterranean. In the autumn of 1956 an international crisis broke out when the Egyptian president Nasser confiscated the Suez canal area in order to generate more money for his country. A combined military operation of British, French and Israeli forces under the code name Operation Musketeer was the result. During this operation nine Wyverns from 830 Squadron based on HMS Eagle flew operational missions to Egyptian targets over a one week period. 2.11.1956 6 Wyverns flew 18 sorties on Huckstep Camp, a big storage depot used by the Egyptians; dropped 15 bombs of 454 kg. 3.11.1956 4 strikes on Gamil Bridge with 22 bombs of 454 kg and 8 bombs of 227 kg. Bridge was partly destroyed. WN330 of Lt. McCarthy was hit in the engine by flak; he had to eject over sea. 4.11.1956 no sorties flown, but two additional Wyverns flown in on HMS Eagle. 5.11.1956 support missions of paratroopers landed near Port Said Coast Guard barracks. 16 sorties flown in 3 strikes; dropped 17 bombs of 454 kg, fired 176 unguided underwing rockets and fired 2250 rounds of 20 mm grenades. Lt. Cdr. Cowling flying WN328 had to bail out over water after been hit by flak. 6.11.1956 17 sorties flown to Port Said. Dropped 6 bombs of 454 kg, fired 162 unguided rockets and fired 1200 20 mm rounds. In general, the Wyvern was found to be a suitable strike fighter, making successful sorties with only two Wyverns lost by light anti-aircraft flak. Both pilots escaped unhurt with their ejection seat. Operation Musketeer was tactically a complete success that inflicted heavy losses on the Egyptian side. However, strategically it was a disaster when British and French authorities had to accept a cease-fire and final withdrawal of all their military forces under the pressure of international politics! All Wyverns were withdrawn from operational status by spring 1958 and all were scrapped except the R.R. Eagle powered VR137. 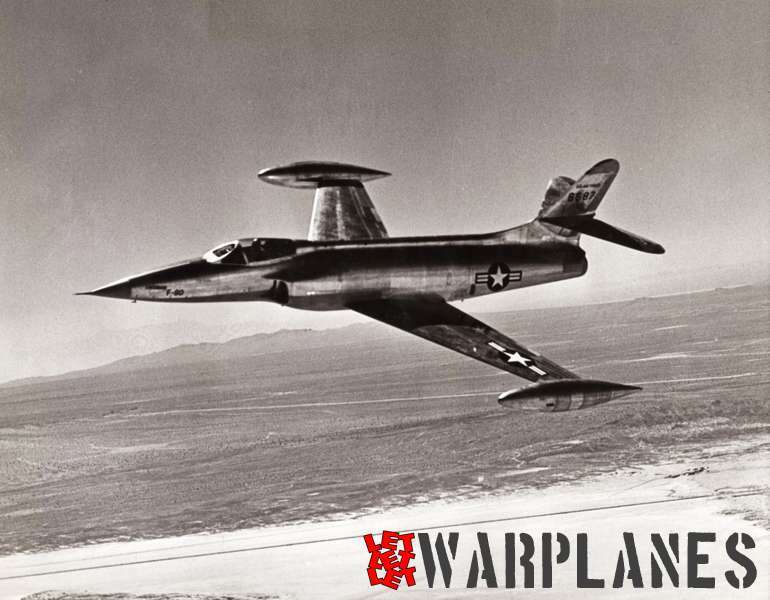 We may conclude that the development of the Wyvern took quite a lot of time and when the Wyvern became finally operational in 1953 it was already obsolete. 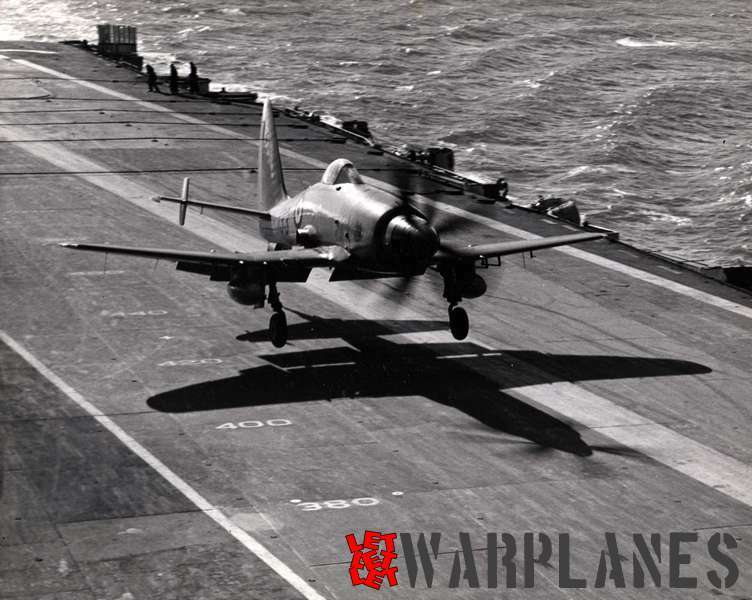 As a shipboard attack bomber it lacked a second crewmember and sufficient range and speed. 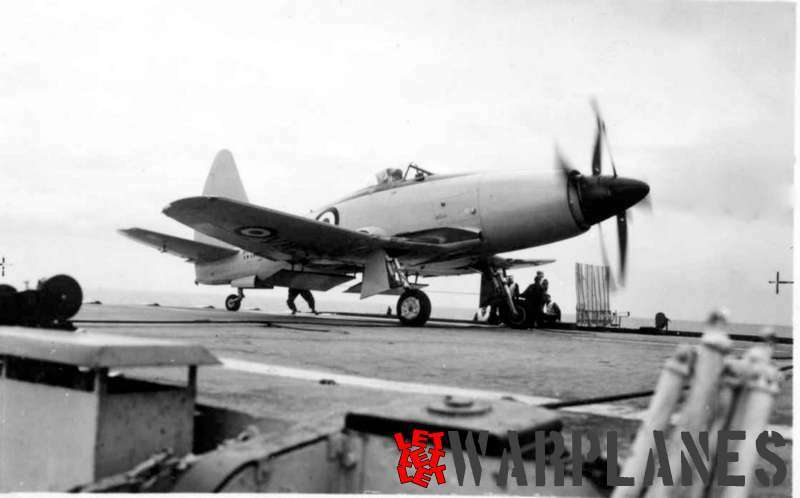 As a defending naval fighter it lacked not only speed, but also manoeuvrability. It only had a short operational career, marred by quite heavy operational losses. In spite of this, it had shortly before it was withdrawn its moments of success in the Suez campaign! 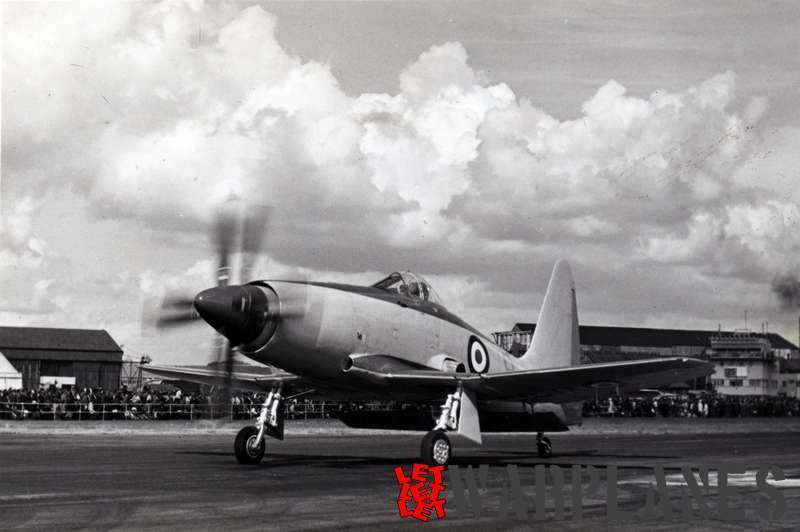 The seventh and last of the pre-production TF.Mk.1 batch fitted with the Rolls-Royce Eagle 22 piston engine was delivered to the College of Aeronautics at Cranfield in November 1950 where it was displayed in bare natural colours. It was transferred to the Historic Aircraft Preservation Society in May 1962 and subsequently presented to the Fleet Air Arm Museum at Yeovilton, where it is still on display in standard Fleet Air Arm colours and with its original serial number VR137. This particular plane never flew! After the Wyvern was retired from active duty they were all melted down during 1959 and VR137 is the only Wyvern in existence today. 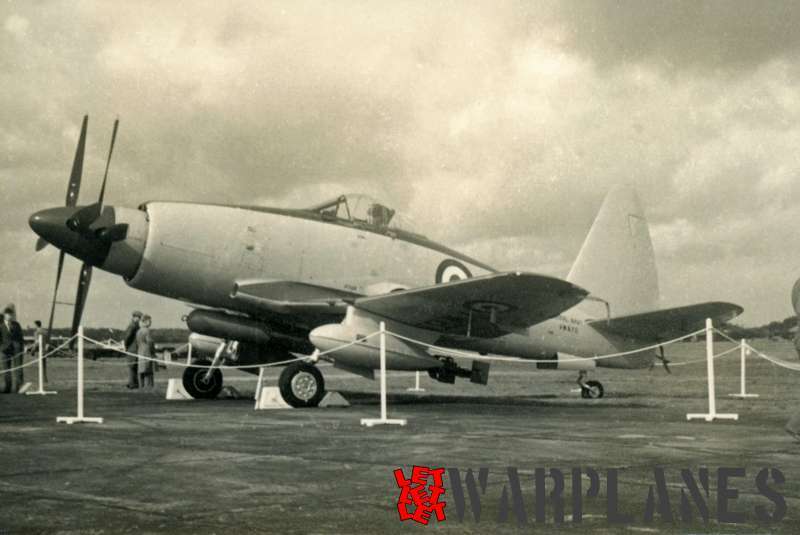 The prototype TS371 started its life in bare metal scheme with ‘P’ in a yellow circle on both sides of the rear fuselage as mandatory for prototypes. Later it was painted extra dark sea grey on fuselage and wing upper sides and Sky Type S on undersides. The operational Fleet Air Arm Wyverns all had the mandatory scheme extra dark sea grey on the upper side of the fuselage and horizontal tailplanes with the underside and fuselage sides painted Sky Type S. The Wyverns as used operationally during the Suez crisis carried black and yellow stripes around rear fuselage and wings. All lettering on the Wyvern was in black. Propeller spinners were red or Royal Blue. The single T.3 trainer had a bare aluminium all-over scheme with on the fuselage side the suffix ‘P’ for prototype in yellow on a yellow band. Propeller hub and spinner were also bare aluminium. A beautifully made 1/72 scale CMR model of the R.R. Eagle prototype TS380, complete with an aerial torpedo under the fuselage. 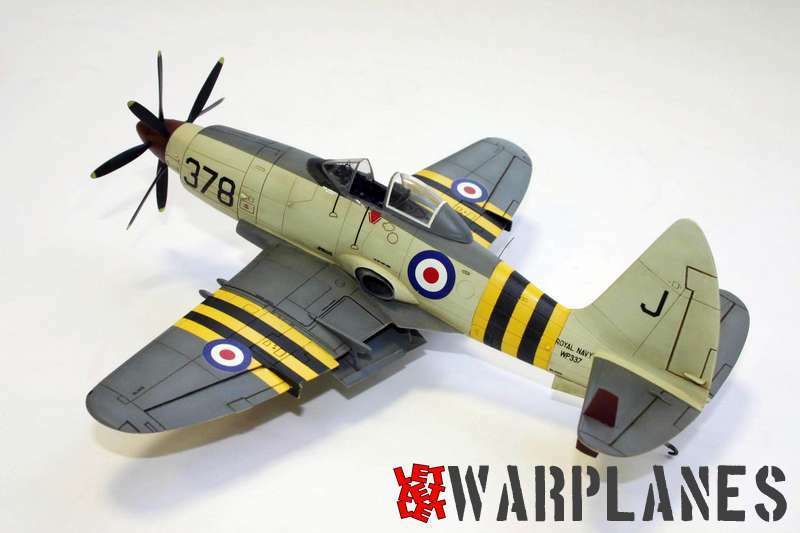 -Frog already introduced many years ago a 1/72 Westland Wyvern kit of moderate quality to modern standards. Later it was re-issued by the Russian Novo. Both are now collector’s items. -Air Classics has an excellent limited-run injection moulded 1/48 kit of the Python powered S.4 model that replaced some earlier produced much more demanding vacform kits. 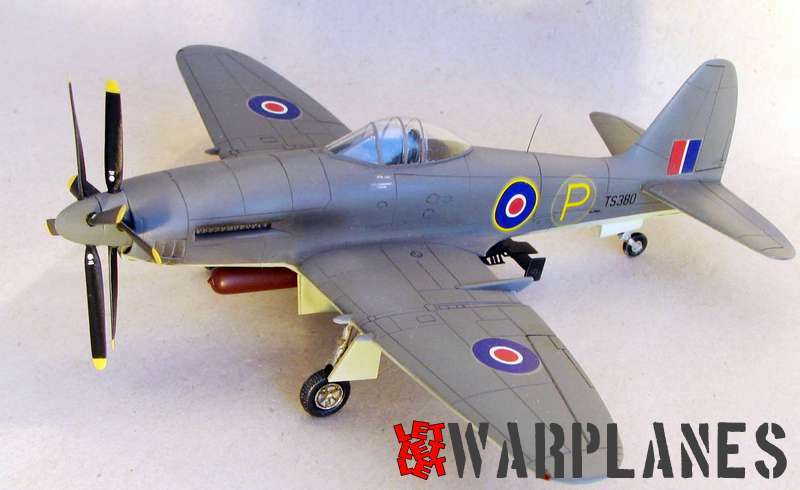 -CMR kits from the Czech Republic has at 1/72 scale two resin models kits of the Wyvern in R.R. Eagle version (No.CMR-140) complete with an aerial torpedo and the Python powered Wyvern S.4. As usual quality is excellent with very good decals included. Another beauty: Wyvern S.4 WP337 in the characteristic markings of Operation Musketeer. Powerplant: 1× Armstrong Siddeley Python 3 axial flow turboprop of 3667 shaft-hp and 535 kg residual exhaust thrust. -For the Wyvern there was a parallel specification from the Royal Air Force, F.13/44, for which Hawker submitted the competing P.1027; a development of the Tempest and also fitted with the new R.R. Eagle. Finally, both R.A.F. variants were cancelled in favour of new jet aircraft. -The wyvern was a mythical monster with the front legs of a dragon and the barbed tail of a snake. 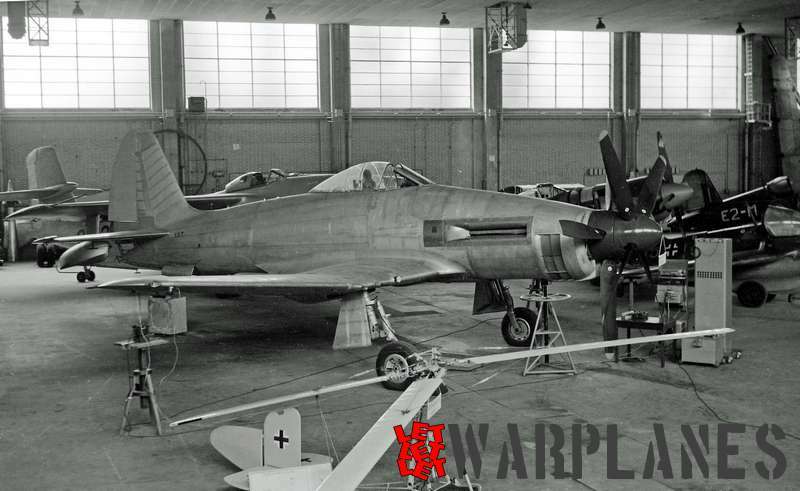 -The Wyvern was in fact the only single-engine turboprop strike fighter ever operational! For the U.S. Navy Douglas had developed the turboprop powered A2D-1 Skyshark, but this only flew as prototype. Also the Soviet Union built an unsuccessful single-engine turboprop attack plane as the Tupolev Tu-91 ‘Boot’. -During the Suez Campaign the Wyvern was assisted by French Aeronavale F4U-7 Corsairs. 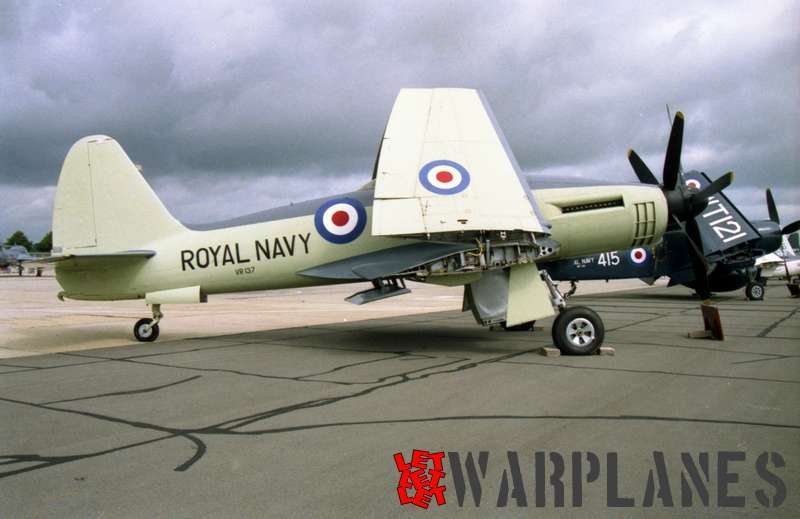 The British forces also used the Hawker Sea Hawk, that could carry the same offensive load as the Wyvern over the same distance but at a some 200 km/h faster speed . 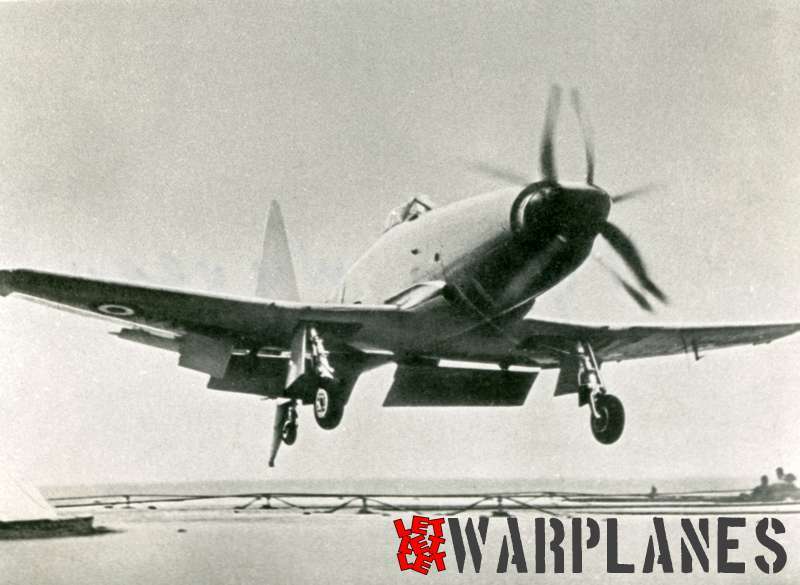 Even the French Corsairs were marginally faster than the Wyvern! -The S.4 had in the rear fuselage provision of two portholes for two oblique cameras and another porthole on the underside of the fuselage for a vertical camera. As far as known, they were little used for this purpose. -Derek Collier, Westland Wyvern – Flight test accidents of the 1940s-1960s, Aeroplane Monthly Nov.
-John T. Smith, Wrath of a Mythical Monster: Westland Wyvern Operations in the Suez Campaign, Air Enthusiast no. 74, March/April 1998.